Time will tell if the Phillies’ offseason spending splurge ends up being fruitful or perhaps “a little bit stupid.” But arguably no team in baseball made a bigger push towards contending in 2019 than Philadelphia, as a number of headline-grabbing transactions should have the club battling for the NL East title. Chronologically, the Bryce Harper signing was the last of Philadelphia’s major winter moves, as the contract wasn’t finalized until early March. But we’ll begin here, since speculation about Harper dominated not just the offseason as a whole, but specifically the Phillies’ plans. It was no secret that the Phils were aiming to land either Harper or Manny Machado, as perhaps no team was better positioned both payroll-wise and competitive desire-wise to make such an enormous signing happen. It wasn’t always clear how many teams were involved in the markets for Harper and Machado, though the Phillies were a constant fixture both on the rumor mill and in behind-the-scenes negotiations. Once Machado ultimately signed with the Padres for ten years and $300MM, the stage was set for the Phillies and Harper to finally find common ground. The Athletic’s Matt Gelb and SI.com’s Tom Verducci both penned outstanding chronicles of the Phillies/Harper talks, and the clincher for the Phillies was their willingness to give Harper the very long-term commitment (with no opt-outs or options, and a full no-trade clause) he was seeking. The result was a 13-year/$330MM deal that stood as the single largest contract in baseball history, until Mike Trout’s extension with the Angels set a new standard a few weeks later. By all accounts, Harper is prepared to be a Phillie for life, giving the team a new high-profile face of the franchise for this next decade-plus. Harper was willing to sacrifice some average annual value that he could have found elsewhere on a shorter-term deal, yet his top priority was both security and firmly setting down roots for the remainder of his career. It could also be interpreted as a reaction to the slower nature of the modern free agent market — after hearing whispers about his impending free agency for years, and going through the process once, Harper was all too ready to never test the market again. Harper was the final touch (or, to borrow from a groaner of a Scott Boras pun, the harp in the orchestra) on a transformative offseason for the Phillies. GM Matt Klentak had an open checkbook and seemingly just about free rein to turn an 80-win team into a contender for the National League pennant. Klentak’s first big swing wasn’t a signing, however, but rather a five-player trade with the Mariners that addressed multiple problems for the Phillies in one fell swoop. Philadelphia unloaded first baseman Carlos Santana and his contract, opening up first base for Rhys Hoskins to return following Hoskins’ ill-fated sojourn as one of baseball’s worst defensive left fielders in 2018. The savings on Santana’s remaining two years/$35MM created more flexibility to take on the $58MM/four years still owed to Jean Segura, who immediately upgrades what had been a very shaky shortstop position for the Phillies. The trade also saw Philadelphia add bullpen depth in Juan Nicasio and James Pazos, while former top prospect J.P. Crawford (once thought to be the shortstop of the future) headed to Seattle. Barring a sudden downturn from Segura, or Crawford blossoming into a superstar for the M’s, this deal looks like a solid win for Philadelphia. Since Santana had become an extraneous asset for the Phils and it seemed like they were ready to move on from Crawford, the team essentially ended up adding Segura, Nicasio (owed $9MM in 2019) and a controllable arm in Pazos for only an additional $32MM in new money. That’s a more than reasonable price for Segura, who has been one of the game’s best middle infielders in recent years — to put Segura’s value into perspective, his 11.9 fWAR since the start of the 2016 season is the virtual equivalent of Harper (12 fWAR). With Hoskins now back at first base, this cleared the way for Andrew McCutchen to return to Pennsylvania as the Phils’ new left fielder. It’s been a few years since McCutchen’s superstar prime with the Pirates, though the veteran is still a solidly above-average bat. McCutchen’s defense is also no longer the detriment that it was in his later years as a center fielder, as he posted respectable glovework metrics as a right fielder last season with the Giants and Yankees. Perhaps the only thing eyebrow-raising about this signing was McCutchen’s $50MM price tag. Only six free agents received more in guaranteed money this winter, though in a vacuum, it doesn’t seem exorbitant for a durable and productive player’s age 32-34 seasons. The Phillies probably didn’t mind spending a few extra million to address an outfield need before the Winter Meetings were over. After the bullpen got some attention in the form of Nicasio, Pazos, and a trade with the Angels to acquire southpaw Jose Alvarez, a bigger name joined the relief corps when David Robertson inked a two-year, $23MM deal. Robertson figures to serve as the Phillies’ primary closer this year, though Seranthony Dominguez and Hector Neris can step into the ninth inning if Robertson is deployed in a critical situation earlier in the game. In the same way that the Phils chose to deal Crawford for an established star at shortstop, Jorge Alfaro went from being a future building block at catcher to a new member of the Miami Marlins in another blockbuster trade. It was Philadelphia who finally ended up with J.T. Realmuto, ending over 18 months of rumors about where the Marlins would eventually send the All-Star backstop. Miami was known to be asking for a haul in return for Realmuto, and the Phillies’ successful offer was nothing to sneeze at — Alfaro, top pitching prospect Sixto Sanchez, intriguing 21-year-old pitching prospect Will Stewart, and $250K in international bonus money. It’s a lot to ask for just two years of Realmuto’s services, though Alfaro is still raw as a contact hitter, and Sanchez has had some injury problems in his young career. Plus, given the recent trend of star players taking extensions rather than wanting to take the free agent plunge, the Phillies have to feel good about their chances of keeping Realmuto beyond the 2020 season. Even for just the short-term, of course, Realmuto provides an enormous boost just by dint of being the best catcher in the sport. Realmuto is coming off his best season yet, hitting .277/.340/.484 with 21 homers over 531 plate appearances in 2018. Speaking of extensions, the Phillies also signed young ace Aaron Nola through at least the 2022 season. Nola’s deal is a four-year pact worth $45MM in guaranteed money, and could be worth $56.75 in total value if the Phillies exercise a club option for 2023. The extension covers all three of Nola’s arbitration-eligible seasons and up to two of his free agent years, making it a fantastic investment for the Phils in locking up a 25-year-old right-hander who finished third in NL Cy Young voting last season. As MLBTR’s Jeff Todd noted at the time of the extension, Nola could have been lined up to earn in the range of $30MM just through his three arbitration seasons, had he won his then-pending arb hearing that was canceled by the news of the extension. For the Phillies to gain two additional years of control for up to only $26-$27MM more is a nice result for the team. From Nola’s perspective, he can still hit free agency after his age-30 season and locks in a life-changing payday now — no small matter for a pitcher who has a UCL scare in 2016. It’s hard to argue that the Phillies won’t be better in 2019 than in 2018, given both the quality and sheer volume of their offseason additions. The trouble is, the rest of the NL East didn’t stand pat. The Nationals and Mets also made several notable moves, while the Braves had something of a quieter winter but are still the reigning division champions with an exciting batch of young talent. Philadelphia conducted its winter business with an eye towards long-term success, though if the club falls short in 2019, there will certainly be debate as to whether the Phillies could’ve taken some extra steps. Given the long list of new faces, it’s hard to accuse the Phillies of only taking half-measures, though in this respect the team is something of a victim of its own promises. The previously-linked Matt Gelb piece contains an amusing section about how owner John Middleton’s notorious “stupid money” comment added pressure to the front office, and made the Phillies a popular target both for player agents looking for suitors and for rival teams looking to trade a hefty contract. Also, when a team spends its offseason checking in on seemingly every available free agent or trade candidate, fans and pundits can’t help but coming up with what-if scenarios. For instance, since the Phillies addressed almost every other area of their roster, it is perhaps a little surprising that the rotation was left untouched. This wasn’t for lack of trying, as the Phils had talks with free agents Patrick Corbin, J.A. Happ, Yusei Kikuchi, Dallas Keuchel and others, while also exploring trades for the likes of Indians ace Corey Kluber. As the season starts, however, the Phillies will run back their same core group of Nola, Jake Arrieta, Nick Pivetta, Zach Eflin, and Vince Velasquez. This isn’t necessarily a bad thing, as this starting five delivered generally quality results last season. Nola looks to be the only true frontline starter of the bunch, however, as Arrieta has taken a step back from his ace days with the Cubs, and the rest of the young arms are talented but lacking in experience. Robertson, Alvarez, and Nicasio weren’t the only relievers on the Phillies’ target list, as they also looked far and wide for bullpen arms. This search took them in some interesting directions, as Philadelphia reportedly had interest in signing Nathan Eovaldi as a reliever, which seems like it a bit of a head-scratcher since Eovaldi was getting starting offers from seemingly half the league. Edwin Diaz was also considered by the Phillies before Seattle dealt Diaz elsewhere within the NL East, and free agent closer Craig Kimbrel was also linked to the Phils in rumors. After Harper signed, some reports suggested that Philadelphia could turn its attention to Keuchel or Kimbrel, though the Phillies only seemed interested in either pitcher on a short-term commitment. Over a month after those reports, Keuchel and Kimbral are both still available should the Phillies want to pounce. While there hasn’t yet been any indication that Keuchel or Kimbrel would be willing to settle for one-year deals, you have to figure that possibility must exist now that Opening Day has come and gone. Either pitcher could be waiting until after the draft (so teams no longer have to surrender picks to sign them, as per the qualifying offer) to finally agree to a prorated deal, potentially just covering the remainder of 2019 so they could try again in the 2019-20 free agent market. Rather than signing a coming-in-cold Keuchel or Kimbrel, however, there’s nothing stopping Philadelphia from adding to its rotation or bullpen via a midseason trade. The Harper/McCutchen signings left the Phils with something of an outfield surplus, so the likes of Nick Williams or (when healthy) Roman Quinn could be dangled in a deal. The farm system has been thinned out by the losses of Crawford, Sanchez, and Alfaro, though some interesting prospects remain if the organization again wants to move more young talent in another win-now strike. Beyond just the question of 2019, of course, is how the Phillies’ biggest signing will play out over the next 13 seasons. The Harper-or-Machado debate will quite possibly rage for years to come. Harper has been slightly more valuable (31.3 fWAR in 3980 career PA to Machado’s 30.4 fWAR in 4102 career PA) thus far, though Machado has been the more durable player and has been a premium defender at third base. Harper’s defensive metrics cratered last season, which Boras claims was due to lingering effects from Harper’s knee problems in 2017, though it stands out a pretty noteworthy red flag. Will Harper be ultimately worth a 13-year commitment? If the Phillies win a World Series or two during his tenure, the “flags fly forever” argument might outweigh any struggles Harper has in the final years of that deal. Going by past examples of 10+ year contracts, Derek Jeter’s ten-year, $189MM pact with the Yankees is the only deal that stands out as an unqualified success for the team that originally made the signing. The sheer length of the agreement, however, means that Harper’s AAV is just over $25.38MM per season. This helps the Phillies for luxury tax purposes, as even after their spending spree, the team’s projected Competitive Balance Tax number (as estimated by Roster Resource) is currently just under $191.4MM, still a good ways below the $206MM tax threshold. Signing a Keuchel or a Kimbrel even on a prorated contract might put the Phils over that threshold, which is another reason the club could prefer wait until the trade deadline for further additions. Beyond just the new players on the roster, the higher expectations will put more pressure on the incumbents to up their game. The Phils are lacking in center field depth, adding even more importance to Odubel Herrera’s ability to bounce back from a disappointing 2018. Cesar Hernandez is also looking to rebound from a subpar season, though an injured foot in the second half of the year may have been the biggest culprit to Hernandez’s drop in production. Maikel Franco spent much of the winter as, essentially, Schrödinger’s Third Baseman — both the Phillies’ in-house starter at the hot corner and also the player expected to be shipped out of town at a moment’s notice if Machado was signed. Ironically, San Diego was the team most closely linked to Franco in trade rumors before the Padres themselves landed Machado. 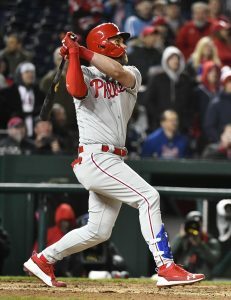 Franco is now again slated for the bulk of third base time, with Scott Kingery standing out as the superutility option at third, second, shortstop, and in the outfield. Since Kingery, Williams, and Altherr all underachieved last year, the Phils added to their bench depth by signing veterans Sean Rodriguez, Andrew Romine, Shane Robinson, and Phil Gosselin to minors deals. There’s a possibility the Phils make a significant improvement in the win-loss column but not in the NL East standings, given what their division rivals accomplished in the offseason. Philadelphia has at least gotten itself back into the conversation as a legitimate postseason contender, however, and as it wouldn’t be a surprise if the front office again gets aggressive come the trade deadline.